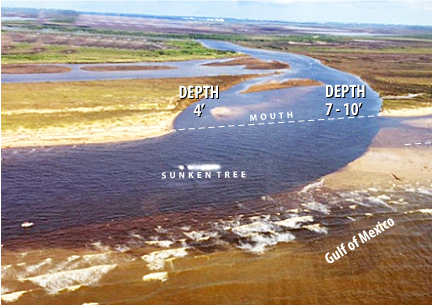 The river mouth has sat shut for four years and nine months, not opening to the Gulf of Mexico, but a big push from Hurricane Harvey flood waters corrected that condition. Yes, it’s open! The depth on the east side of the river is between 7 - 10 ft and about 4 ft on the west side. It measures 40 to 50 ft. across. Keeping the mouth open is the next big challenge. Stay tuned for what measures are planned next! Earlier flood water photos below.